Your donations will be matched, up to $20,000! Renowned human rights attorney Jesselyn Radack founded the non-profit project Whistleblower & Source Protection Program (WHISPeR) to protect the most controversial and courageous truth-tellers in the world. She represents Edward Snowden, Thomas Drake, Bill Binney and John Kiriakou, who told the public the truth and have been exiled, criminally investigated, or prosecuted under the Espionage Act. Without whistleblowers, sources, hacktivists, and journalists, we would not know about NSA surveillance, torture or civilian casualties in the U.S. government's drone campaign. WHISPeR attorneys represent dozens of still-anonymous national security, intelligence community, and human rights whistleblowers, who are bankrupted, blacklisted, and ostracized. WHISPeR represents them for free. Even when a legal remedy is available, it can take years of expensive litigation. With your donations, WHISPeR can dedicate much-needed resources to litigating whistleblower cases in court. Truth-tellers have your back. And WHISPeR has theirs. WHISPeR advocates for truth-tellers, defends them in court, and helps them safely speak with journalists and filmmakers. At a time when government secrecy is expanding, government surveillance is more pervasive than ever, and the government claims more executive power to detain and kill even American citizens without due process, our democracy needs whistleblowers, sources, hacktivists and aggressive investigative journalism. Defending whistleblowers, who are often isolated and smeared as "traitors," is not generally a popular or well-funded endeavor. But in this key moment, one of our donors has agreed to match your donations, up to $20,000. All donations to WHISPeR are tax-deductible. Julian Assange.Chelsea Manning. We are deeply obliged for their revealing truth that would be concealed by our murderous government. Please donate. Chelsea Manning is the epitome of the kind of person we should aspire to be. God bless whistleblowers and thanks for all you do to support them! Because it's very important to acknowledge good deeds! Whistleblower and source protection guarantees public transparency and accountability. We will always need those who speak up against the misuse of power by our government! The public needs to know about the corruption perpetrated on it by its own government. 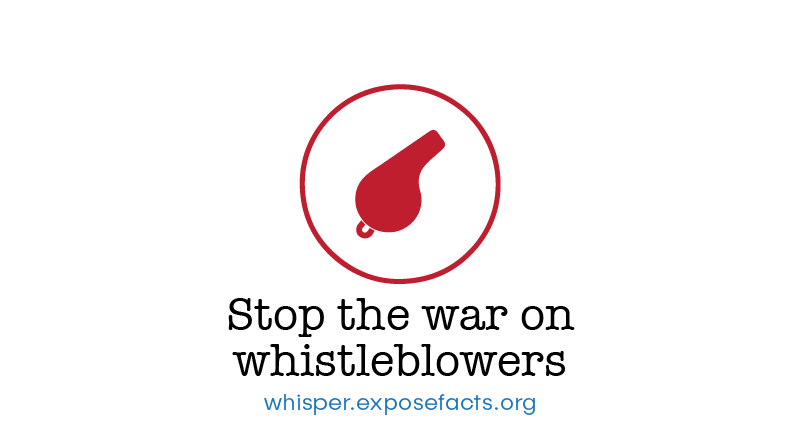 Support for Whistleblowers equals support for Justice and Truth! It's just the right effort to support.